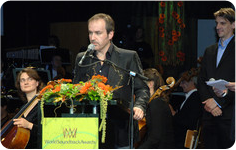 During the latest Film Music Festival, organised by the International Film Festival Flanders Ghent, we had the chance to talk to composer David Arnold, just a few hours before he would be handed over a World Soundtrack Award for Best Original Song, obviously that is You Know My Name for Casino Royale. With a cup of coffee, seated at a table too small for 3 people, we talked about the recent Godzilla release, his career, and even clothes (though, the latter is not included in this interview). 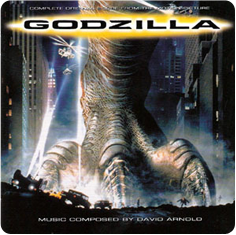 MAIN TITLES: Finally, Godzilla was released under a complete edition. How does it feel that it finally got released after almost ten years? DAVID ARNOLD: The odd thing about writing a film score is that once it is done, you have no control on whatever happens to it. You just leave it behind and you have to carry on; if I was to thread, whine and weep over the fate of every note that I write I'd be dead by now! You always hope that you get a release and that people will want to hear it but out of the context of the film, I don't think it's that important to be honest; it's written to go with the film, that's what it is. I was disappointed when it didn't get released and I'd have preferred it if it had come out at the time when the film came out. I still don't really know why it didn't, but it is fantastic it got released 10 years later! It is incredibly long! I can't even remember writing half of that stuff but it's a huge amount of music! I could never listen to it in one go, but sure it's good for the people who are kind of collectors and the fans of film music to have everything, and it is pretty much everything, everything that was ever recorded is on that CD. It's good 'cause nowadays I don't get e-mails from people asking me "Why wasn't Godzilla released?". DA: I give them the same answer, you know. I did want, I did prepare one for a release and the studio didn't release it. MT: So it's not stated in the contract that there is going to be a release? DA: No, there are no guarantees the music will be released on cd. Unfortunately with the file sharing, the general attitude that music should be free any way nowadays, it's kind of all changing. So you wait and see what happens. But I was thrilled when it came out, even I didn't have a copy of it! [laughs]. MT: Really? You didn't have a copy of tapes or anything when it was recorded? DA: No, Sony has got all of those. MT: So you don't have any rights to it or anything, like a personal private record? DA: No. I am pretty sure it is somewhere, back in the DAT [Digital Autotape]! I wouldn't mind to rely on a 10 year-old DAT as an archive. I don't know how long these things last so it's going to be interesting in 20 years time to see what recordings will actually survive on such an early digital tape. MT: Godzilla was one of your last big scores. It made kind of a trilogy with ID4 and Stargate and now fans wait for a new "big one" to arrive. Something has definitely changed since Godzilla. DA: I wasn't really offered this sort of films anymore and I am not sure why that was. I am not sure why I got offered the ones I did get offered; the third Narnia film, which was supposed to be immediately after the next Bond, would be a chance to go back to more traditional fantasy style scores that I haven't done for quite a long time. The one thing I love about those things is that there are no rules. Nothing is actually real, you don't actually have to worry about having a responsibility to truthfulness in a real sense; it's just about how to make the film's feeling and heighten the film's effectiveness. You're not telling a true story. It's not like Amazing Grace which was a film about something that really happened, a film that has actually affected real people... A giant talking lion (in Narnia) is not the same sense of responsibility. Obviously you're respectful of the material and of the certain amount of truth there still is in the film you have to be honest with. I am really looking forward to it though, it's been such a long time since I last done this sort of thing, I am interested to see how I write now, it is a long time ago. MT: When you hear about a new project, a new movie, do you sometimes lobby to get a certain project? Because you often hear about actors or actresses who say they want to play a character, or they know and love the story and therefore want to do it. Does it ever happen with a composer, like for example for a project like Spider-Man? DA: I did that for James Bond in some way, not really lobbying though. But generally, I don't; I can't really say if anyone else does but I don't. If there's a film I am interested in, if I read about it in development or something then I'll certainly call up and just ask them, ask my agent to find out about it and let them know that I am really interested in it as a project. Sometimes I have lots of different ideas about what I want to do with it, but I don't remember doing it that often. Half the times you read about something that interests you too, you're already doing something else so you can't do it anyway; it's quite annoying. I did read a lot of awfully lot modern comics when I was younger and I am watching these films come and go and thinking that it would be great to work on. I even liked Iron Man. I think that's one I would have wanted to do. It's brilliant. And Fantastic Four; that was one that I read a lot about and it would have been fantastic to do. But I never really came out and said that I really, really, want to score such a project. DA:. Yeah, it is interesting with Narnia too, which I was reading when I was younger. It was virtually Harry's [Harry Gregson-Williams] show, really and I'm yet to speak to him about it because I said to the studio it's Harry's case and that he should be the first to be called. I respect Harry and I did make my feelings know it should still be Harry's case. Michael [Apted, director of The Chronicles of Narnia: The Voyage of the Dawn Treader] knew that was so, but he wanted me to do it. And then you've got a difficult situation where you can't really say no to a director with whom you've worked three times and you'll hopefully work again in the future and you've got a good working relationship with. MT: Would you be offended if in a franchise, say like James Bond, they'd choose someone else for the music in the next film? DA: Well not offended, not that. I always feel that the intriguing thing about the Bond films is that they're a kind of an unfinished business. There's always the chance to do it again and hopefully do it better, do it different and you feel a certain hitching. I've grown up with it and I've been a part of it for the past 10-11 years, which really doesn't seem or feel all that long. I think I'd be disappointed but I've always said that at the end of these films - as I have with Roland (Emmerich) when we were doing Stargate and Independence Day - I don't expect to be asked back just because I've done this one, anymore that I don't expect them to cast the same actors the same time. Some people have very long established relationships with composers though like Alan Silvestri, John Williams, Debney and Iglesias with Almodovar. MT: Is it like a safety net ? DA: Well some directors use the same editor or the same cameraman each time and others sort of change entire crews every time so I don't think you can be upset for anything. Things happen like this in this business, all the time. As long as I can do what I want to do reasonably well and on a daily basis, I am quite happy. I am sure that time will tell. MT: In Casino Royale you hinted in your You Know My Name - theme to On Her Majesty's Secret Service. Can you tell a bit more about references to earlier Bond scores. DA: The whole thing with the match on On Her Majesty's Secret Service was the idea of how do you write a Bond score without using the Bond theme as such, like kinda writing a new Bond theme. You Know My Name would be the theme that represented James Bond in this film, whilst the James Bond Theme crept up behind it and appeared at the end. It shared the same DNA, the same kind of harmonic basis. You can play the Bond theme over the course of You Know My Name in a certain way - there's a (specific) way of doing it – and it kinda pokes into your memory and all the history of that piece of music without stating it that blatantly. What I wanted to do with the song, is make it feel like at the end of that song, it was like "here's James Bond". It was almost like the prequel to the James Bond thing; almost. And then he arrives and then he's there, it all makes sense. It was like Batman Begins in music form [laughs]. MT: Do you change of ideas a lot during recording? When you hear for example a piece performed and it doesn't sound totally sound right and isn't as good what you heard in your head? DA: Well that happens quite a lot indeed! You hearing something performed for the first time rather than just being mocked up on a synth and it's something which might sound comfortable in the synthesizer and all of a sudden it sounds comfortable in the real world. Or you just realize that there's already so much else and you don't need something. So we curve notes notes on the score, we take stuff out, we play around with players, with where the microphones go in which sides of the room, ... There are a lot of changes that are made. Obviously, It partly depends on what the director is thinking of as well. He has his own idea on how things should be and I've got mine so we've got to be somewhere in-between. MT: Is there a often a clash? Like some directors are too controlling? DA: Well, I'll give you for instance: at the end of Casino Royale when Vesper [Eva Green] was drowning, when she pushed herself away from Bond and actually kinda committed suicide by virtually killing herself, Martin [Campbell, the director of Casino Royale] wanted a very gentle, beautiful piece of music there. I always thought it should have been kind of tense and tearing and really vividly emotional and I almost had a great difficulty not making it like that because that's the way it felt it should have been. It just felt that it needed to be so fierce [in accordance to] what she was doing and representing not only the violence of her actions but [also] Bond's inability to save her. So we went over that one 2 or 3 times, cut different versions of it and we ended up kind of recording a gentler version of the more violent music; so it's virtually the same music but played in a little less violent way... But I'd still would have preferred it like I said, you know. It's a collaborative midair, it's not all about what I want all the time. It's not about what the director wants all the time anymore than it is about what the editor or the actors want. It's certainly the film as best as you can. And that's true even in the initial stages of the production. Whenever we're presenting a new Bond film I am always trying to get less music, especially in the action sequences. The way these things are cut nowadays, it's all cut in Avid [professional video editing software] and presented as an almost finished thing because you can have 10 pre-visual effects, you can have fights. Whatever you can do, you represent it in the Avid and it's not like the past where you had to process it to a lab and get it process and then back to you to present it. Now it's done immediately and when you present these sequences to a studio, you want them to be as impressive as possible. So most of the times it's the action sequences that have music on all over them because it adds to that sense of excitement. Difference is that you're not watching the film from start to finish, you're just watching these bits when you're presenting a film, and you're merely watching a scene. So a lot of time you have music all over for that reason, to kind of help the selling of that moment and then it's very difficult to convince people that there shouldn't be music. I like to think about it in the overall scheme of the whole film rather than just looking at the action sequences by themselves and what happens is that there is a kind of a safety sake: "Can you write music all the way through it?" and then we try taking it out. However, it's usually almost there from start to finish. I'd much rather that we had less and save it for when you need it, save it for when there's an emotional need for the music rather than just having it playing all the time. Like when there's a very noisy sequence, I'd love hearing the sounds of screaming tires or engines, or machine guns; all of these things can make a huge impact! And then you wipe them all away for the music to and then when it comes, it all wretches it up a little. So what I try to do is get less in but I think nowadays more is more, everything has to be very fast. And you can have an argument, a discussion about what you think it should or shouldn't be, but ultimately there's a direction you'll have to follow, this this and this, that that and that, louder and "I want music all the way through it" and in that case you either refuse and get replaced or do the best that you can. All you can do is represent your side of the argument as good as you can. You know that sometimes the director will prevail or you will, but you always have to know the reasons behind your arguments. However, everyone's different, every time it is a different process. MT: On to some quick random questions, often asked on forums, as our time is limited. Some film music fans wonder if the Cropduster theme for ID4 was your unused demo from CutThroat Island? DA: There were a few bits and pieces actually that I used in Independence Day that I originally did for CutThroat Island [pauses] which gave me great pleasure! [laughs][pauses] Ah, I'll have to go back and listen to that. I was pretty happy with the stuff I wrote for CutThroat Island. It was just an impossible situation so there's a lot of quite good music that came out of those two weeks, but we never recorded any of it. [hums the Cropduster theme from ID4] No, it was not that, I remember it now and It wasn't that. It's another bit's work! MT. Do you follow what fans think about you on the internet? DA: People find you and tell you what they think, so I generally know what the opinion is about what I am doing. However, I've got an opinion as well and if somebody hates what I do that's a shame, but I know what I like and what I hate too. If I was on a message board and someone said "What about this score?" and I'd say "God, that's the worst thing I've ever heard and he shouldn't even be doing it" then that's my opinion, [but] it doesn't make it the truth. MT: Is there a score of you that got negative response but which you were proud of? DA: I really liked Changing Lanes, because it is so perverse. I think the soundtrack is a challenge; it does nothing that perhaps your every soundtrack fan wants. There's no big orchestra's in it, no huge themes, no thundering action sequences or glorious souring love themes, and no balletic complex John Williams like orchestrations. It's an ugly, challenging, horrible noise. I liked it. That was what the film represented to me. It was all about internalizing, I wanted it to feel like the sound you feel in your head when you get up too quick. It's the sound that your body makes inside of yourself when you're about to loose control, when you want to do something you're gonna regret the rest of your life. It's that rush, that horrible, ugly, uncomfortable human biological kind of mess. That was my initial reaction on seeing the film. Also, for the temp score they had in the film, there was this sort of prototype New York smoky piano jazz bar. We're here in New York, and I wanted to show it from the other side, from the gutter in a bar rather than from the city you know from The Empire State Building. Realizing that from where I'm standing here side, it's pretty uncomfortable. MT: You visit the film festival Ghent each year. When are you going to be part of the program? DA: Well, they never asked me. We've been talking to do something, not in Ghent, for something else with the people who organize the festival, but as far as being here, as part of this October week, they haven't asked me. If they'd ask, I'd say yeah. MT: Thanks a lot for your time. See you again tonight. Thanks to David Arnold, Steven de Jonghe and the organisation of the International Filmfestival Flanders Ghent. Thanks a lot to Demetris for helping to write out the interview and Marie-Lise for corrections. Bregt De Lange and Mario Schuurmans.